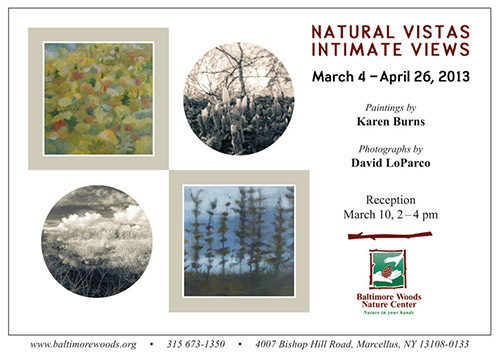 Please join us for the opening of a fine show of Dave's photographs and Karen Burns' paintings at Baltimore Woods Nature Center in Marcellus, NY Sunday, March 10, from 2-4pm! A wonderful place to visit if you've never been there including miles of scenic trails. If you visit Dave's website you can see some of the work he will be showing www.davidloparco.com.